With US equities opening sharply higher, the VIX was knocked back into the 15s. 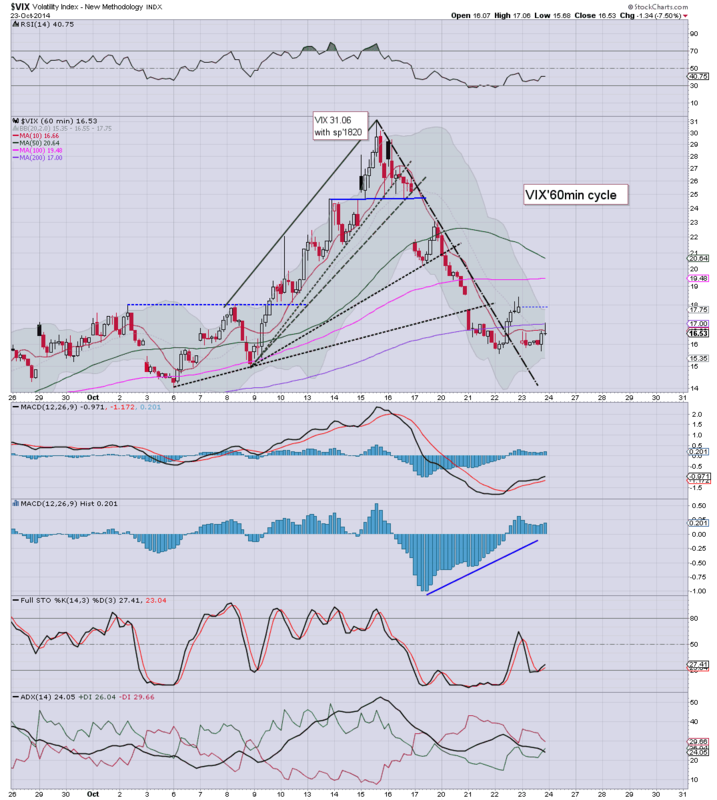 Despite an opening reversal candle, the VIX failed to climb, settling -7.5% @ 16.53. 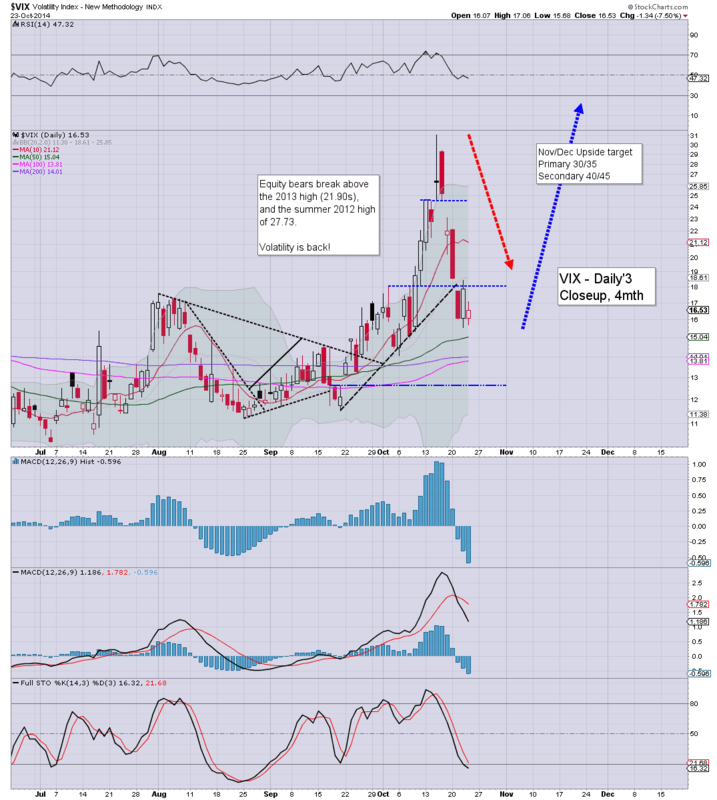 Near term outlook is for VIX to melt lower into the 14/13s by next Wednesday. Little to add. VIX looks set to remain subdued for another 3-4 trading days. 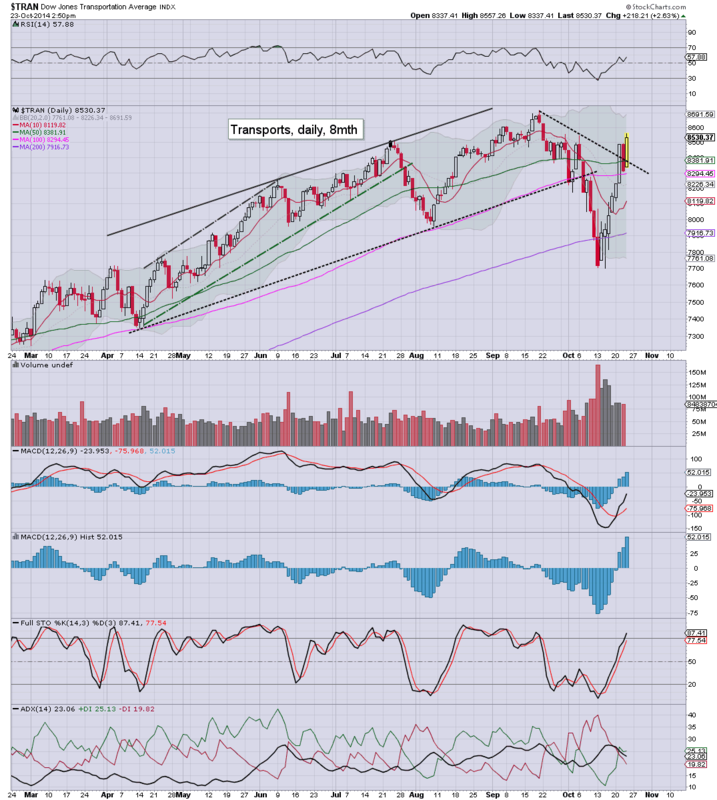 US indexes saw renewed gains, sp +23pts @ 1950. The two leaders - Trans/R2K, both settled powerfully higher, by 2.1% and 1.8% respectively. 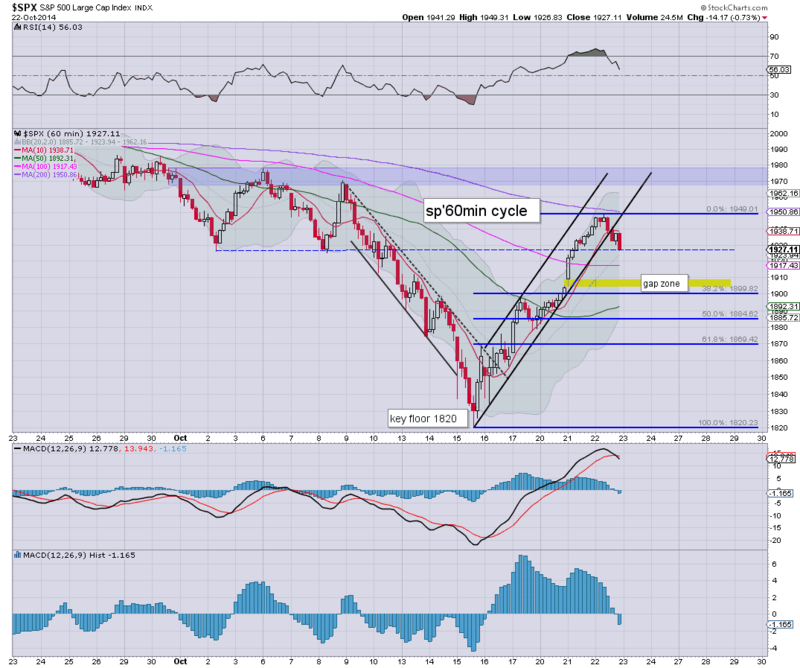 Near term outlook is for continued upside into the FOMC of next Wednesday. Suffice to say... this morning should have opened moderetely lower, to at least 1915/10... but no.. .a large gap higher.. and we just keep on climbing. For now, this is no market for the bears... and it is arguably a case of 'no shorts' until next Wednesday afternoon.. when the fed will officially terminate QE3. However, if the Transports has broken new historic highs by that time, the notion of trying to re-short this market is arguably off the agenda. Whilst the main market continues to climb, the real hyper strength is in the 'old leader' - Transports, higher by a huge 2.6%, into the 8500s. A new historic high in the Trans would be a major problem to hopes of renewed weakness in November. So, even if the sp' gets stuck in the 1960s.. along with Dow 16900s, ... if the Transports starts breaking new highs, it will likely rule out any kind of November 'crashy' action. 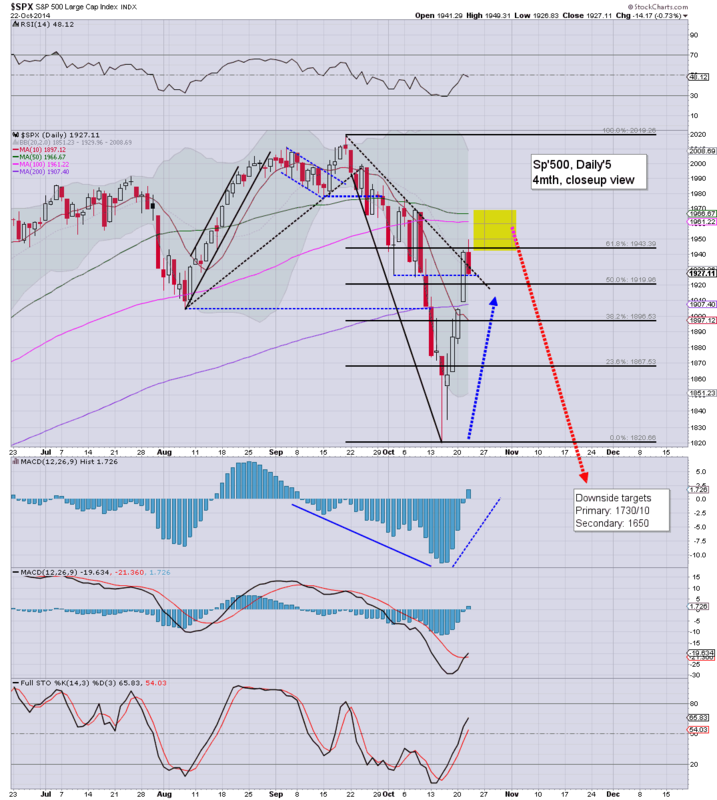 For now.... its a case of wait and see how far the bull maniacs can push this...into next Wednesday. VIX is naturally re-crushed, -11% in the upper 15s. *AMZN earnings at the close.... I'll look for a ($1.10/30) loss... but hell, across the last few years, even when AMZN posts lousy numbers, the stock often still ramps. 3.07pm.. market a little twitchy on some kind of 'Ebola news'. 3.22pm.. So.. an Ebola headline knocks 10pts off the sp'500... twitchy market. 3.30pm... As explosions rock London.... (pre Nov' 5th terror celebrations)... the market is stuck around 1950. Certainly, this cooling is helping to ease the concern that we'll just continue on a hyper ramp..straight to new highs. ... awaiting AMZN earnings...... due immediately at the close. US equities are holding very significant gains of around 1.5-2.0% for most indexes. Price structure is a baby bull flag on the smaller 60/15 min cycles, and it bodes for 1960s.. whether late today.. or early tomorrow. *metals remain mixed, Gold -$12, whilst silver is flat. Miners are naturally weak, GDX -1%. Suffice to say.. this is no market for the bears... at least until next Wednesday afternoon. Price structure is certainly offering the low 1960s by the close of today... a mere 0.5% from the 'last line'. 2.24pm... Trans +2.8%... if a new high.. it really does serious damage to hopes of a bigger wave lower in November. US equities are holding very significant gains. The two leaders - Trans/R2K, are both strongly higher by 2.3% and 2.0% respectively. Near term outlook is for continued moderate.. and increasingly choppy gains into the FOMC of next Wednesday. 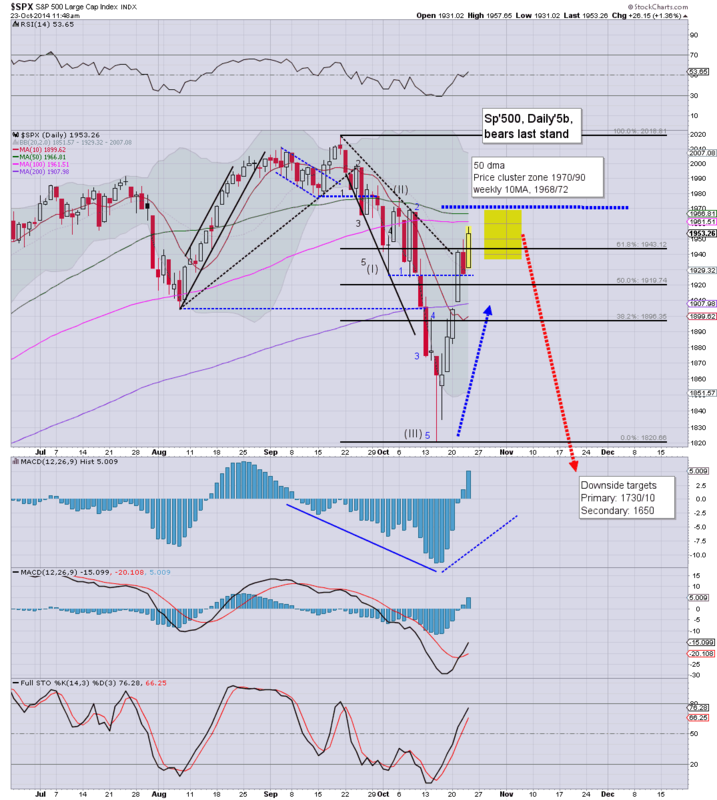 The weekly 'rainbow' candle started the week red... soon turned blue, and is now outright bullish green. This is not unexpected though... but the bigger bearish outlook will have to get dropped on any sustained price action >1970. Its day' 6 UP, and there is zero sign of this madness ending until next week. There seems zero point in being short the market until the next Fed announcement is out of the way. Even then, if we're sustainably holding >1970... then arguably, shorts would be off the agenda. US equities push to new cycle highs on what is day'6 UP, since the sp'1820 low. VIX offered an opening reversal.. but failed. Metals are mixed, Gold -$13, whilst Silver is flat. Oil is building strong gains, +1.5%. *I realise many out there are still calling a floor in the metals.. and miners, but no... the broader weakness remains. What was most notable about last week, despite some real upset in the US capital markets... Gold barely caught any kind of 'fear bid'. 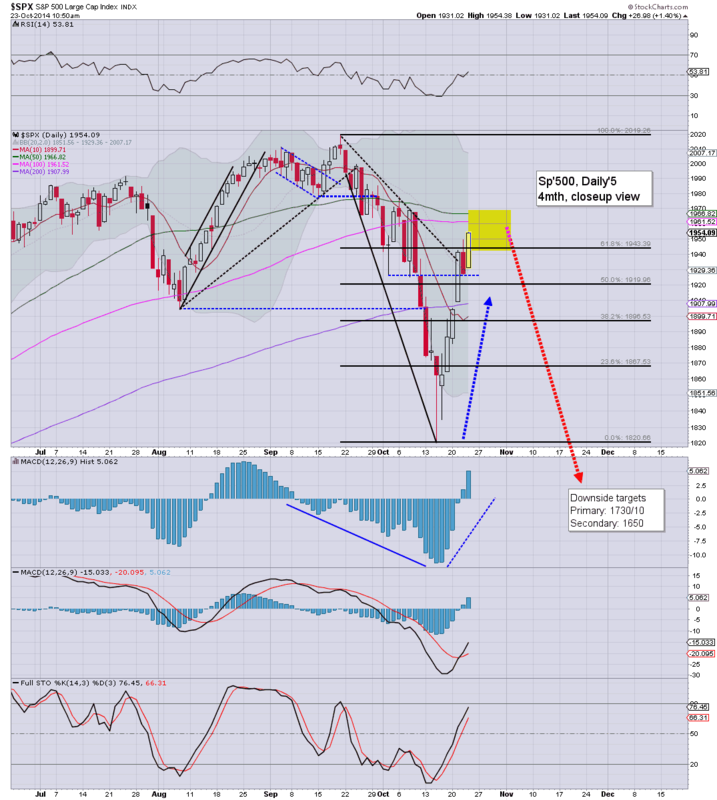 So.. new cycle highs of sp'1954, and we're within 0.7% of my 'last line'. Regardless of the immediate term, I'm going to hold to a 'no shorts' policy until the next FOMC announcement is out of the way. 11.02am.. 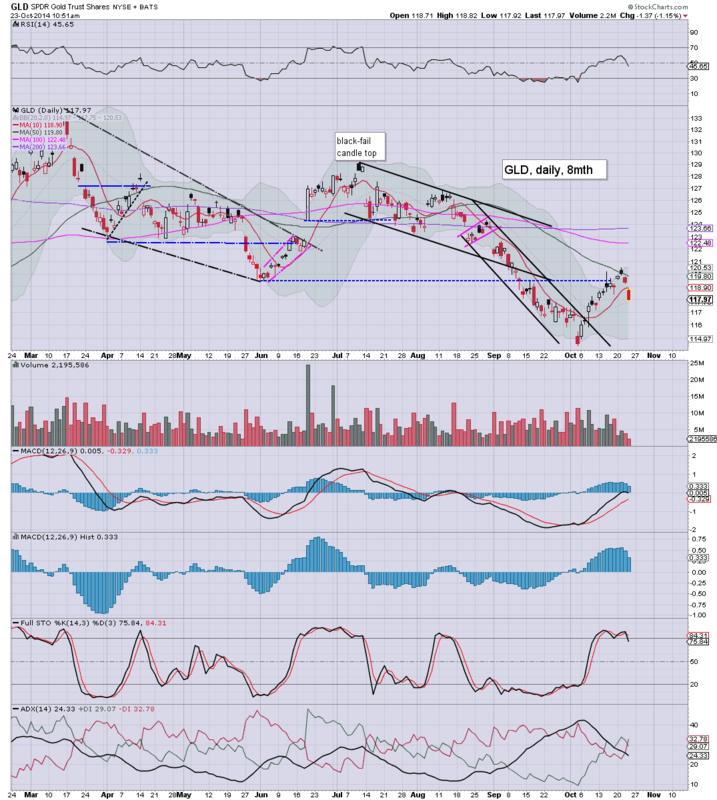 The miner ETF of GDX -1.4% @ $20.15... set to lose the 20s... taking out the 2013 low... inline with weak metals. Regardless... zero point in being long miners for another 6-12 mths. 11.10am.. sp'1956... VIX 15s..... this is starting to get a little crazy.... no doubt the QE fuel... the penultimate one is helping. AMZN +0.9%... ahead of earnings at the close.... most stupidly valued stock in the entire market. The sp'1910/00 zone is once again a fair way lower, and right now, there is obvious support around the mid 1920s - as was the case Oct 2nd and 8th. If the VIX can keep pushing higher this morning, equities will fail... and there is high chance of renewed weakness. We have an interesting day ahead.... in any case though, I'm still looking for 1950/60s next week. 10.08am... Opening VIX reversal.... FAILS. New cycle highs... sp'1950... and with $1.5bn of QE this morning.... bears now look toast. 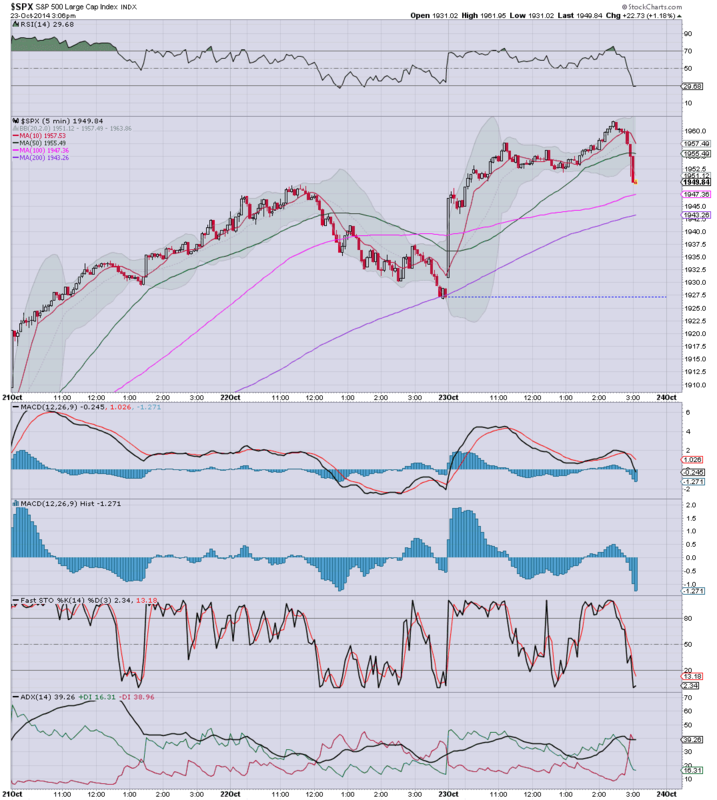 10.45am.. sp'1953 a little earlier... VIX back in the 15s.... there is nothing good here. I've zero interest in considering a short until next Wed' afternoon.. when the Fed will terminate QE3. Good morning. Futures have swung higher (for no apparent reason), sp +18pts, we're set to open at 1945, a mere 4pts shy of yesterdays high. Metals remain weak, Gold -$7, with Silver -0.4%. Oil is significantly higher by 1.0%. So much for the Wednesday afternoon weakness, which looks set to be entirely reversed at the open. Oh well, 1950/60s look due anyway, whether today, tomorrow.. or next week. Regardless of any near term retrace to the sp'1910/00 zone, market looks set for 1950/60s next week... coinciding with the next FOMC, when QE3 is set to be officially concluded. 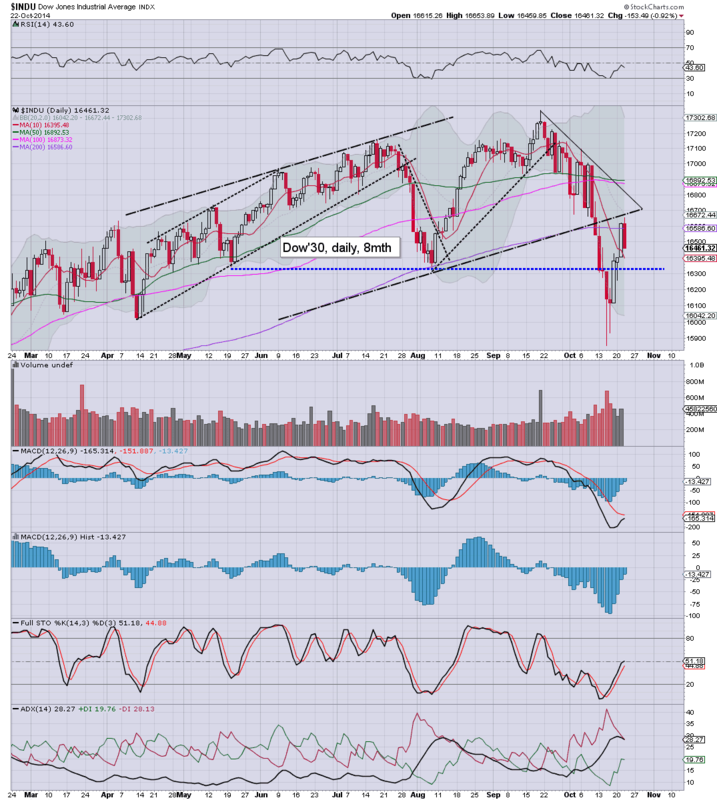 Frankly, the setup for November, is near perfect for the equity doomer bears. 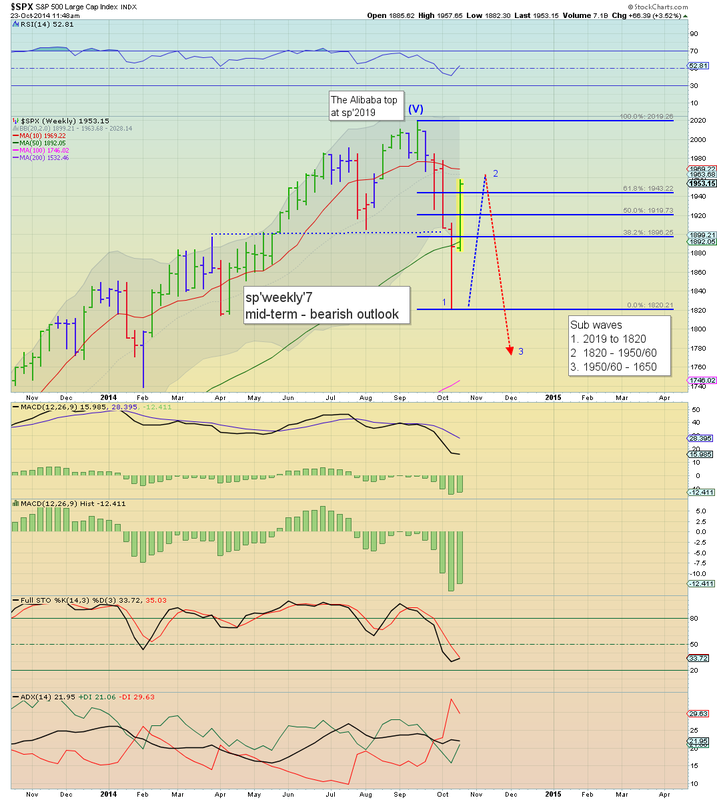 A bounce was expected.. and we've already seen a huge move from 1820 to 1949. My 'last line' remains around 1970... I certainly don't want to see any sustained price action above there.. otherwise the bigger monthly cycles will start turning back upward. We have a fair few bits of econ-data, jobless claims, PMI manu', and leading indicators. 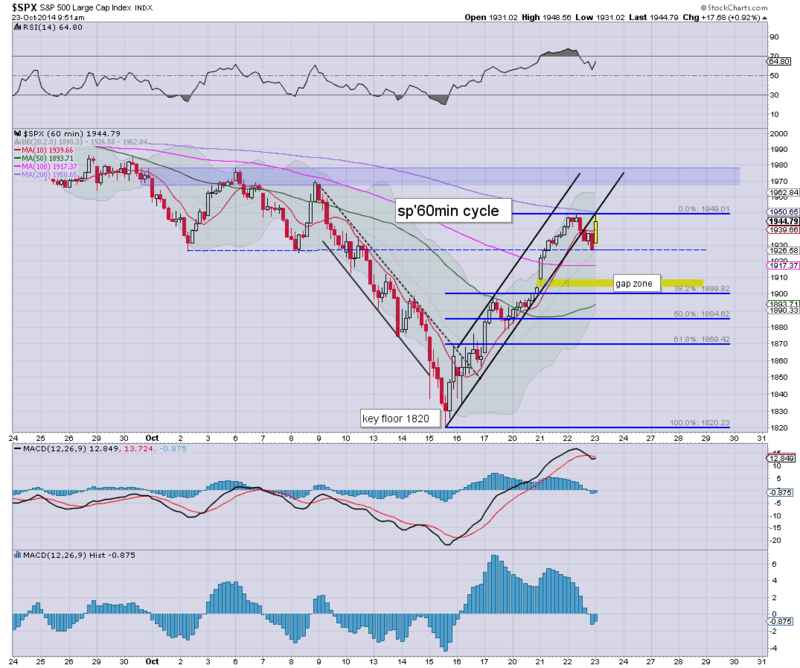 US equities closed very weak, having broken a new cycle high of sp'1949, but settling -14pts @ 1927. The two leaders - Trans/R2K, settled significantly lower by -2.0% and -1.4% respectively. 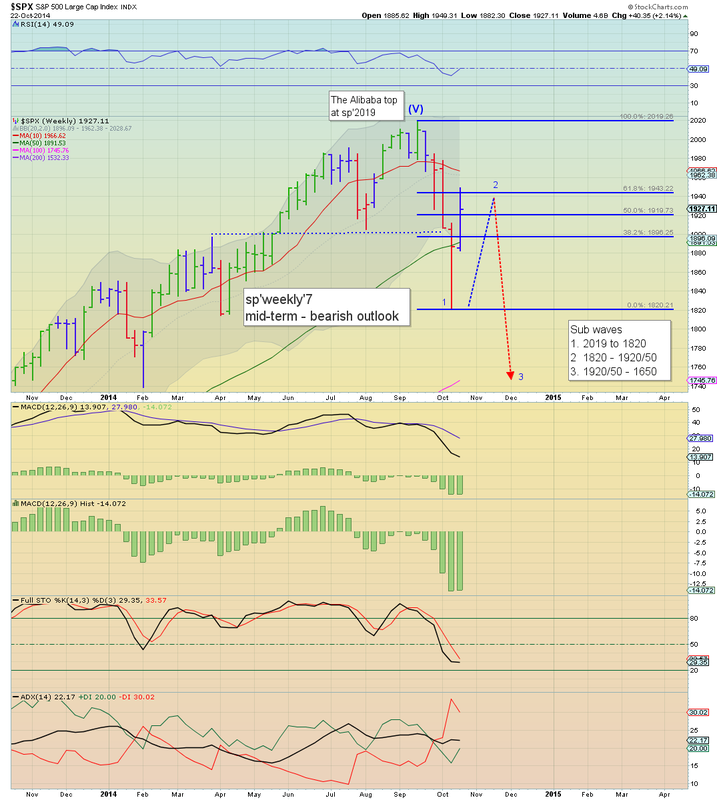 Near term outlook is for 1910/00 zone, before 1950/60 next week. Suffice to say... a new cycle high of sp'1949 - some 129pts higher across just 6 days... but now we're in some kind of minor retrace. 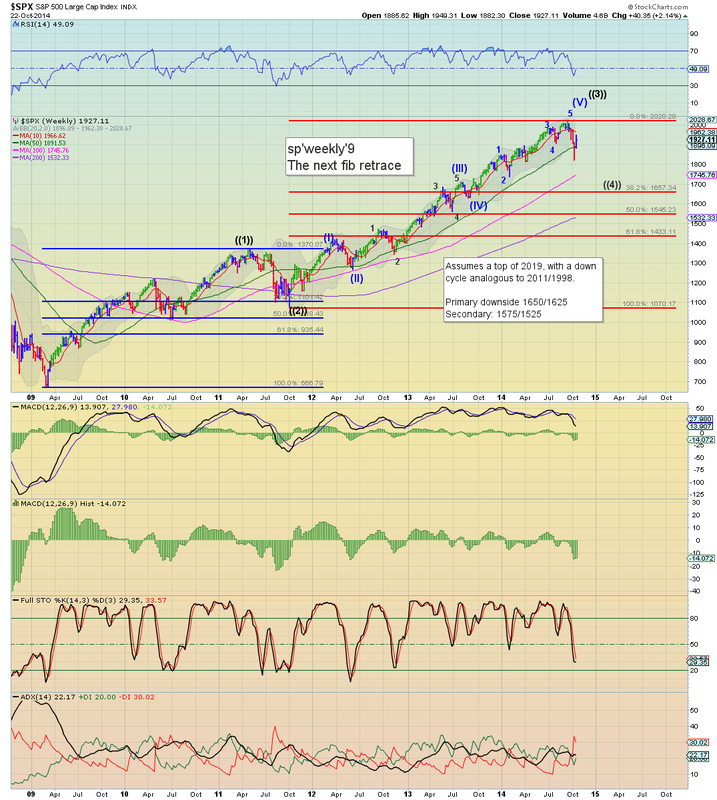 Market will likely hold the 1900 threshold, before renewed upside next week to 1950/60s.